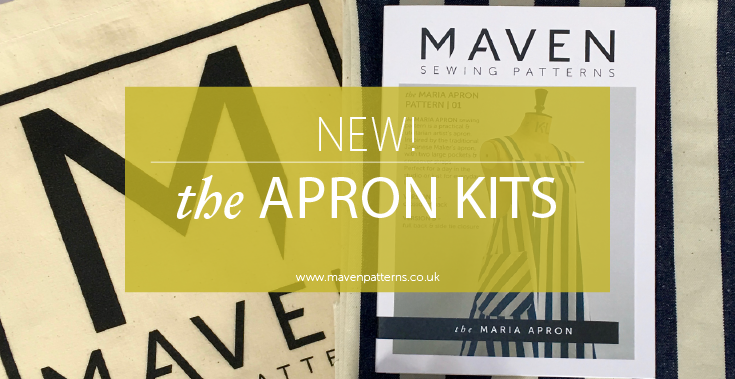 I’m so pleased to announce our Apron kits are now available online! Our Japanese style apron kits were very popular at the shows this year and so we have resourced the fabrics and voila – here they are in time for Christmas! These kits contain everything you need to make your own Japanese style Makers apron and would be a beautiful gift for a lucky Maker friend or a lovely project for you! We have two kits to choose from, each with enough fabric to make version A of The Maria Apron, along with the paper Maria Apron pattern, interfacing, thread, label & Maven tote bag. Indigo moon is a beautiful block printed cloth, printed by Artisans in India using traditional techniques and coloured with natural dyes. Because block printed fabrics are printed by hand they will never be perfectly printed in the same way as mass produced and digitally printed cloth is. They have irregularities in their print, making them unique and these should be valued as part of their beauty and charm. You can find the Indigo Moon Kit here. Our stripe kit has a lovely soft denim in a denim/ecru colourway with a 2.5cm stripe, giving you the opportunity to make a feature of those large, useful pockets by experimenting with the stripe direction. You can find the stripe kit here. FABRIC BY THE METRE? Why yes, of course! Already have the Maria Apron pattern but would like to make a spotty or stripey one? We are happy to sell the fabric separately by the metre (or parts of a metre) – Indigo Moon is £12 per metre / Stripe is £16 per metre.